Nicholas James Fradiani IV (born November 15, 1985) is an American singer from Guilford, Connecticut. He rose to regional attention as the lead singer of pop/rock band Beach Avenue when they won the Battle of the Bands at Mohegan Sun in 2011. They gained national recognition in 2014 when they competed on the ninth season of the reality talent show America's Got Talent, although only making it to "Judgement Week". In 2015, Fradiani entered as a solo singer on the fourteenth season of American Idol. Fradiani won the show in May 2015, becoming the first winner from the Northeast region. He came from Connecticut in the New York Audition. He headlined the American Idols LIVE! Tour 2015, a thirty-seven city tour over eight weeks featuring the top five contestants. Fradiani was born on November 15, 1985, in New Haven, Connecticut and is the son of Nick Fradiani III, a musician, and Elizabeth Fradiani (née Maher). He is of three quarters Italian and one quarter Irish descent. His father performs in clubs, restaurants and on cruise ships. He gave his son a drum set when he was two years old, followed by encouraging him to learn how to play piano and later guitar. Fradiani has a sister, Kristen, who was born a day before his sixth birthday on November 14, 1991. Kristen and their paternal cousins Jamie and Nicole all attend Southern Connecticut State University. Their paternal cousin Dean Fradiani Jr., son of Nick Sr.'s late brother Dean Fradiani Sr., is the owner of Fradiani Landscaping, LLC, in East Haven. Nick currently resides in Nashville, Tennessee. Fradiani graduated from Guilford High School in 2004. Fradiani has a Bachelor's degree in history from Wheaton College, Norton, Massachusetts. As a musician in a band, he held a daytime job as a computer software salesman for a couple of months. After obtaining a History degree, Fradiani intermittently worked as a substitute teacher at schools while mainly focusing on picking up gigs at local bars wherever he could. Fradiani became well known for his covers of Matchbox 20 and Katy Perry songs that he played religiously at all of his gigs. Fradiani rose to regional attention as the lead singer of Milford, Connecticut-based pop/rock band Beach Avenue when they won the Battle of the Bands at Mohegan Sun in 2011. The five-member band released original materials including Something to Believe In EP in June 2012 and Driving That Road EP in July 2013. In 2014, they released two singles: "Coming Your Way" and "Feel the Beat". Three members of the band, Fradiani, Abraham and Zipp gained national recognition 2014 when they competed on the ninth season of the reality talent show America's Got Talent, singing their original composed song "Coming Your Way". Fradiani cites singing the original song on the show as his "biggest career break". The audition was aired on NBC in July 2014, and the song entered the iTunes Pop Singles Chart reaching #53; it sold 6,000 copies in the first week after the televised audition. All four judges voted "yes" for the band to go to the next round. The band made it to "Judgement Week" broadcast on July 22 and 23, 2014 where the band played another of their original songs titled "Feel the Beat" before elimination from the competition. "Coming Your Way" remained in the Top 200 for over two weeks, selling more than 10,000 copies. Fradiani auditioned in New York City and his golden ticket song was Peter Gabriel's "In Your Eyes". During Hollywood Week, he sang "Babylon" by David Gray. He sang Train's "Drops of Jupiter" during the House of Blues Showcase, earning his spot in the Top 24. He was announced as the winner on May 13, 2015, with Clark Beckham finishing as runner-up. Fradiani's winning song was "Beautiful Life", recorded on Big Machine label. "Beautiful Life" was the FIFA 2015 Women's World Cup Official Anthem. as deemed by viewers "American Girl"
"Arena anthems" "Harder to Breathe"
Contestant's own soul "Bright Lights"
Hometown's Choice "Because the Night"
Encore with original artist "Back Home"
Following Fradiani's Idol win, his label offered a non-target PledgeMusic campaign for pre-orders and merchandise sales. During the six weeks before the start of the American Idols LIVE! tour, Fradiani played a number of radio-sponsored concerts, as well as working on new songs with writers including Paul Doucette. In September, following the end of the tour, work on the new album intensified, although Fradiani also played shows including Live in the Vineyard and Connecticut's All-Star Christmas, where Rob Thomas invited Fradiani to join him in singing "Bright Lights." Fradiani was also one of the American Idol alumni who represented the show at the winter Television Critics Association panel. On February 12, 2016, Fradiani appeared on American Idol to mentor and duet with Top 24 contestants Thomas Stringfellow and Gianna Isabella. As part of the mentoring packaging with Isabella, the show aired a brief clip of Fradiani's upcoming single, "Get You Home," which he co-wrote with Nolan Sipe, Jaden Michaels, and Rykeyz; it was mixed by Grammy winner Serban Ghenea. The same night, Fradiani shared a longer excerpt, which includes a sample of Young MC's "Busta Move." In an interview with Ralphie Aversa during Backstage at the Grammys, Fradiani described "Get You Home" as "the most up-tempo, funkiest song on the whole album." In multiple interviews, he mentioned that he cowrote every song on the album, for which recording was completed in early February. In a live Facebook chat on February 24, Fradiani revealed that "Get You Home" would be released on March 11, 2016. As a treat for fans, the release date was shifted to March 10, which coincided with the debut live performance on American Idol. A video was shot on March 29 in Chicago, at Virgin Hotels Chicago, with model Michelle Hicks as the female lead. It was directed by Erik White and used real hotel guests as extras. Released on May 19, 2016, the video shows Fradiani having a "cat and mouse game" encounter, starting at the hotel's bar, with a beautiful woman who appears to have no scruples—leading to a steamy night at the hotel and a surprise resolution. In an interview with Boston's Mix 104.1 on May 5, 2016, Fradiani revealed the album's title of Hurricane, to be released on August 5, 2016, named after a track co-written with Jason Mraz and with Fradiani's Beach Avenue guitarist, Nick Abraham. Fradiani and Abraham gave the first performance of "Hurricane" (acoustic) at the B93 Big Summer Show in Modesto, California, on June 10, 2016. Starting in late May 2016, Fradiani also released snippets of the recorded versions of various songs from the album, sometimes accompanied by "behind the songs" videos. The album Hurricane was released on August 5, 2016, and debuted at #1 on Billboard's Heatseekers chart. "Centuries" acoustic cover, originally performed by Fall Out Boy. ↑ "Nick Fradiani on Twitter". Twitter. ↑ Southern, Rodney. "American Idol 14: Interesting Facts About Top 24 Finalists". Celebrity Dirty Laundry. Retrieved 30 April 2015. ↑ Susan Dunne (January 16, 2015). "Guilford Singer Nick Fradiani Is An 'American Idol' Hopeful This Week". Hartford Courant. ↑ "West Haven's Nick Fradiani trying to make his mark on American Idol". 1 2 "American Idol's Nick Fradiani Jokes About Neil Diamond". 2paragraphs. Retrieved 16 May 2015. ↑ Susan Dunne (March 4, 2015). 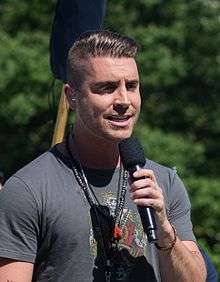 "CT's Nick Fradiani Credits Journey To 'American Idol' To Musical Dad". Hartford Courant. ↑ Scott Gargan (July 2, 2014). "Milford band Beach Avenue on 'America's Got Talent'". CTNews. Retrieved May 13, 2015. ↑ Fortier, Hope-Denee. "Getting Up Close With CT's 'American Idol' Contestant Nick Fradiani". Hartford Courant. Retrieved 16 May 2015. 1 2 Shannon Walsh. "Beach Avenue: 5 Fast Facts You Need to Know". Heavy.com. ↑ Kate Ramunni (January 18, 2015). "West Haven's Nick Fradiani trying to make his mark on American Idol". New Haven Register. ↑ Initially recorded by country music artist Mark Wills in 2003 on his album And the Crowd Goes Wild, it was covered by Bellefire a year later. However, the first version to be released as a single was by pop singer Jo O'Meara in 2005, from the album Relentless. Later that year, country band Rascal Flatts covered the song as well, releasing it as the first single from the 2006 album Me and My Gang, topping the U.S country and adult contemporary charts with it. German band Cascada later had international chart success with the song in 2007. It was also covered by Eden in 2008. 1 2 Courant, Hartford. "CT 'Idol' Nick Fradiani Mentoring Hopefuls, Releasing New CD". courant.com. Retrieved 2016-02-15. ↑ "The 58th GRAMMYs: Nick Fradiani". SoundCloud. Retrieved 2016-02-15. ↑ "Nick Fradiani | Faceboo". www.facebook.com. Retrieved March 1, 2016. ↑ "Nick Fradiani on Twitter". Twitter. Retrieved 2016-03-11. ↑ "Watch Nick Fradiani Perform 'Get You Home' on 'American Idol'". Billboard. Retrieved 2016-03-11. ↑ "Headlines: Is Trump the New Sanjaya? • mjsbigblog". mjsbigblog. 2016-03-29. Retrieved 2016-04-30. ↑ "'American Idol' Winner Nick Fradiani Plays Cat and Mouse Game in 'Get You Home' Video". Billboard. Retrieved 2016-05-20. ↑ "American Idol Winner Nick Fradiani Reveals Title of New Album". Retrieved 2016-05-06. ↑ "Nick Fradiani on Twitter". Twitter. Retrieved 2016-06-13. 1 2 "Fifth Harmony Scores First Top 20 Hit: Hot 100 Chart Moves - Billboard". Billboard. ↑ "Adult Pop Songs". billboard. ↑ "Canadian Digital Songs". Billboard.